You don't have to do any particular thing. Witchiness is about how you are with the world. You can be a Catholic witch if you want. Or an atheist. You can believe and do whatever is best for you. There are no witch creeds. No dress codes. And yet a witch is a very specific kind of person. That old cynical atheist Terry Pratchett had the best insight into witchiness, and I fall back on it often when trying to explain what it has always meant to me. Witches dwell in the edge places. What they choose to do from those places is up to them. Witchiness is not about the doing. It is simply about how you are with the world. Witches have a relationship with both now and forever ... home and wild ... faery and human ... hurt and hope ... spoken and unspoken ... need and cure ... life and afterlife ... skin and soul ... tree and sky ... seed and fruit. Generally, they will feel compelled to do something from this position in the between. And so witches tend to be healers, helpers, writers, justice seekers. It's hard to look into two worlds and not want to bring them together with love. But the wisest and most able witches I know would rather use a kitchen utensil, or a trowel, or the great power of listening quietly, to do an "ordinary" kind of magic. They may like tarot cards, but they know all they really need is to pay attention. Not everyone might be a witch, partly because not everyone believes in the other worlds, other ways, but also because not everyone is willing to bear the discomfort of it. The longing, the energy, the feeling of conflict that is really a wish for togetherness, the sense of being outside others' experiences, the tension between is and could be. Then again, many witches will probably tell you they have no choice. Once you know you can choose love, it's hard to go with anything different. I know the word witch is an unhelpful one, as most words are. Not only does it create difficult images in many people's minds, but it also is used widely for things that aren't true witchness. I can not think of another word that would do, however. Shaman is perhaps too esoteric, too masculine. And besides, a witch knows what to do with an unhelpful word. She gets in between the word and its meaning, and finds ways to bring out the beautiful magic which can be found in any wild, deep space between things, the secret heart of the world. "Witches dwell in the edge spaces"... So much to ponder here. "In that era twins were a bad omen and said to draw evil towards them. The girls also had the gift of foresight and were able to see that which had not yet come to pass. The suspicions of the general public were supported once the girls were old enough and began using their ability. Sibylla was raised at home and it took very little time for the village to notice her unexplainable knowledge of the future. When they did, She was labeled witch and sorceress by the townsfolk and was hated and feared. She led a quiet, empty childhood being bullied and shunned by society. Helena led a very different life. She was sent away to a convent to be raised in the church as a nun. Once her ability was discovered the community revered her and she was seen as a saint and sage by everyone and given the highest respect by even the wisest of men. The two girls grew up facing their own challenges and struggles trying to fit into the societies in to which they had been placed. Helena continued her life as a saint and prophet and Sibylla learned to be a midwife and helped the people as best she could. She was eventually accused of being a witch and sent to jail for life. Helena learned of her sister’s trouble and raced back to the town they had been born in to rescue her. Helena freed her sister from the jail and they ran off towards the forest. Before they got very far, however, they were captured. In her fear of the wrath of the villagers, and of the torment, Helena drank a poison and died in her sister’s arms. Sibylla’s heart was shattered, and while still grieving the loss of the only one in the world she had ever loved, she buried her sister’s body. 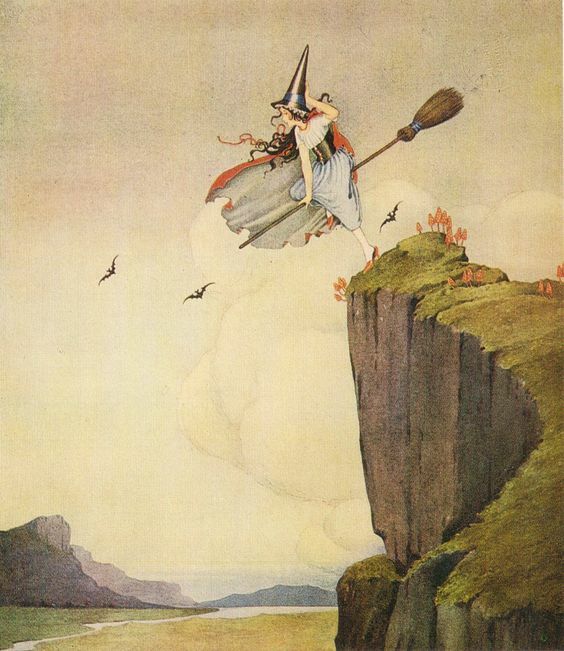 She then rode off to find a place where she would not be known as a witch. She was never seen again. Alternative: It is also said that Helena was burned at the stake for aiding a witch. Alternative: Helena felt bad for her sister and traded places with her. So Sibylla became a saint and Helena a witch." fascinating story! and it certainly illustrates the problem with the word "witch". although that word is being joyfully claimed now in the same way offensive terms are claimed and renewed with good humour by gay people, it has down through history been seen as a negative - and the witch herself as a bad person, even to those like the herbalists, henwives, and wise women whom others called witches. very interesting...and sad. prophecy or foreknowledge (sybilla) and light (helen) were both ultimately unable to live in the tainted, suspicious world. i wish helena had been able to save her sister. I love this. In so many ways. And I'm in the middle of writing something on witches. The accessibility of witchiness - that anyone can be - is something about which I feel passionately. The inclusiveness. And I too adore that Terry Pratchett idea of the witch. It is fitting indeed. I feel very strongly about the commodification and trendification and slick packaging of witchiness. Teen witch books, Charmed, etc - its upsetting. Someone left a comment on twitter re this post about turning people into frogs, and I said that can't be done but you can in a way turn frogs into people - by learning frog language and frog dreams. By growing a relationship with frogs until you understand them, empathise with them, and can communicate with them or share their needs with the world. That's real witchcraft. And not anyone can do that, due to things like personal temperament etc. I do believe there's no barrier between us and the Other, so in that way anyone can develop a relationship with it if they are willing to enter the edge places and dwell there honourably. Therefore yes, witchcraft is open to all. On a side note, separate from what you wrote but I can't seem to stop myself now that I've begun typing, lol - What I am most upset about with Hollywood ideas of witchcraft is the way magic is used and used in a selfish and one-sided manner. But I personally believe witchcraft is about being together in conversation and shared energy with other living things. We only know camomile flowers are soothing and healing because way back in the beginning someone listened to what the flowers had to tell them - what the flowers could offer, and what they needed to grow. It was a relationship. Braiding Sweetgrass is a beautiful book which shows this kind of work. Sorry, I'm ranting but not at you! Thank you for your wonderful comment. I've always been drawn to the word witch. And it was through Wicca that I first learned about the Goddess, though I wasn't able to follow that particular path. But I wanted to tap into those unseen parts of the world, that were hidden, but that I somehow could sense were right there, in front of my eyes. I guess I'm a listening witch, or a priestess. I want to listen to the songs in things. To voices in the silence. Everything has a voice, right? The trees, the sky, the mountains...Not sure if I'm making sense....But I want to learn to walk and see between worlds. And to be guided. i always think of my grandmother, who was devout, if somewhat heterodox, in her catholicism...yet as witchy a person as they come. all religions have some magical elements to them, really; if they are being honest. i studied, but never have identified with, wicca, probably because it has the trappings of religion. which is fine, just not for me so much. you hit the heart of it when you said "once you know you can choose love, it's hard to go with anything different." that is what defines a good person of whatever faith and practice, isn't it?